A cool new forum, where you can chat endlessly ! We're looking for a whole bunch of new members ! So if you just want to have some fun and chat, feel free to join ! It's easy and free. Re: E N D L E S S chat ! conner ! 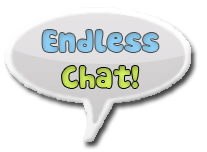 wrote: Endless Chat !